Voicing concerns now – whatever part of the extension you’re addressing – carries extra weight because the federally mandated “scoping period” is under way, recently extended to April 2nd. Tuesday night’s opening presentation (see the full slide deck here) got off to a rocky start due to a sound-system problem that persisted throughout ST executive Cathal Ridge‘s overview. He was followed by Stephen Mak, who has explained the West Seattle segment at most meetings we’ve covered, and he abandoned the sound system entirely, shouting his points loud enough to be heard throughout Youngstown’s Thelma Dewitty Theater. He eventually moved on to the “Delridge corridor context,” including the southernmost potential location’s proximity to community gathering places such as Youngstown and the Delridge Community Center. And the upcoming conversion of Metro Route 120 to RapidRide H Line, carrying riders from as far south as Burien, is a key consideration as well. His presentation made glancing acknowledgment of the North Delridge Action Plan, for which discussion long predated the Sound Transit 3 decision to extend light rail to West Seattle. They discussed neighborhood attributes they appreciate now, including proximity to the bridge and easy access to the rest of West Seattle. And they asked questions including the projected height of the guideway as it approached Pigeon Point, and what ST would do about stabilizing PP if they had to carve into it. Wide-ranging discussion continued, with others circulating around the room and stopping at the table, including Councilmembers McDermott and Herbold, and ST’s Mak. They moved on to discussing the possible station sites; the northernmost one had no fans. 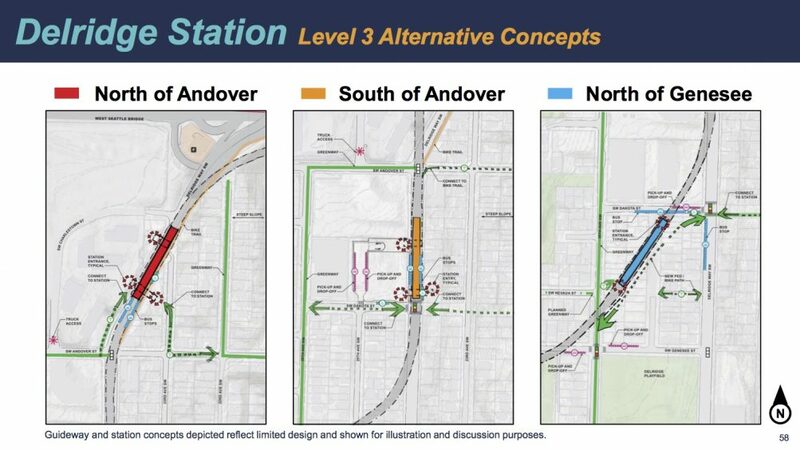 The talk also veered to discussion of tunneling into the West Seattle Junction; a younger participant said The Junction’s character is “the whole reason I moved to West Seattle,” voicing concern that an elevated Junction station would destroy that character. The meeting next Thursday is open to the public, 5-8 pm at the ST board room, 401 S. Jackson on the south end of downtow. 20 Replies to "Where should Delridge's light-rail station be? Sound Transit 'community workshop' tackles the topic"
The 3rd option shown “North of Genesee” takes away to many homes. ST stated at a previous meeting they’d assist homeowners in finding an equal home in size and value. They also stated they’d pay extra to make sure the homeowner gets that equal home. This option looks like ST will be buying a lot of homes. And if all these homeowners want to remain in West Seattle, how long will it take to find these homes? Did Sound Transit say anything about location or just size and value? We already have lightrail in other parts of the city and bus service continues to exist in these neighborhoods. If you use an Orca card, you can already transfer between Sound Transit lightrail and KCMetro busses within a 2hr window (cash can be a little different). Also, the monorail will soon be accepting Orca cards as well. I doubt the entire system will blow up because light rail is being extended to Ballard and West Seattle. Watcher is making a wild third party anecdotal claim that lacks any credence. Who wants in our pockets and how? Well, I think their watching skills are limited, but they seem to be saying Sound Transit wants in our pockets via reduced transit options that will force residents of West Seattle to use light rail. I’m betting the secret talks referred to were between drivers on a smoke break or something, because Sound Transit is well-deep in our pockets via a series of taxing structures that dwarf fare revenue by orders of magnitude. The only reason fares are charged for any transit is to keep the riffraff out. It’s pretty easy to find these numbers since we’re dealing with public agencies. See how much Sound Transit takes in in cash fares vs. how much they spend enforcing fare compliance. There are no “secret” talks happening anywhere… Metro’s current long range plan (currently available on their website) is to probably have only the two Rapid Ride buses (C & future H/120) continuing to run out of West Seattle on the Bridge. And that has nothing to do with getting into anyone’s pockets. You will be able to transfer between buses and trains just like you currently can do elsewhere in the City. Much of the bus service we currently pay for gets “wasted” on buses and drivers sitting in traffic at rush hour. With the trains above or below grade and out of the traffic you would have a time certain trip into Downtown or points beyond. The only things to “cautious” about in the future will be to ensure that the bus hours that are saved by NOT running through all of that traffic get reallocated here in the southwest area to either increase the frequency of existing bus routes to bring people to the station areas or to add brand new routes connecting other parts of our neighborhoods to each other. I’m sorry but this is nonsense conspiracy thinking. ST isn’t in charge of the bus planning, KC Metro is. You can see what Metro’s long range plan is all the way out to 2040 here:Metro Long Range PlanOf course most of the routes don’t go downtown anymore, that’s the whole point of building a rail line! Lets you have rapidride to Admiral and Alki paid for in part with the service hours you save by not crossing the bridge and crawling through downtown. The monorail was before the orca card existed. Do you trust st enough to think they haven’t thought of doing this? I trust ST more than your wild conspiracy theories. I was at the meeting and had a question on the estimates Sound Transit has on how many homes will need to be taken. I was told that they only counted the houses directly under the line for the estimate. Then when I asked if we could see a list of what the addresses of these properties were I was told that they don’t have that in a report. In a previous meeting I was told by an engineer that the software they had drew a buffer on either side of the rail and then houses within that area were counted. But again When I asked which specific houses, or could we see what they used to make their estimates I was told that none of that existed. Confusing. I would think that property owners should be notified if they are currently counted/identified in the estimated group. I feel like this is information that Sound Transit is not interested in revealing. Or it could be that they don’t have that information yet BECAUSE THEY HAVEN’T FINALIZED THE PREFERRED ROUTE. But yeah, let’s just go with the conspiracy theory instead. Or ST has previously offered to sit down one on one with homeowners concerned they are in the current path and they can’t answer those questions on a global scale in a public meeting. Call them up and ask them if your property is one of the ones counted. They’ve said they’ll talk to you. Recently, I had a conversation with a homeowner in the “Youngstown” neighborhood. He and his wife just closed on their house (new construction). Sad that he was never informed by his real estate agent that his house was in the direct path of the new light rail and that he would be under imminent domain seizure in about 5 years. Not too sure how real estate agents like that sleep at night. He said that he would never had bought that house had he known. will be. Am I missing something?